For Devonta Freeman, he knows about playing as an undefeated team. He played on the 2013 Florida State team who went 14-0, defeating the Auburn Tigers in the National Championship. So, how’s he feel about the Atlanta Falcons sitting at 5-0 and looking to get to 6-0 on Thursday night? He’s not stressing, that’s for sure. As Michele Steele of ESPN reports, Freeman says there’s "no pressure" in the situation. Talked to #Falcons RB Devonta Freeman – who played on 2013 FSU team. "I've been undefeated" – says there's "no pressure" on the way to 6-0. Freeman has led the charge for the Falcons, rushing for 405 yards and eight touchdowns so far in 2015. 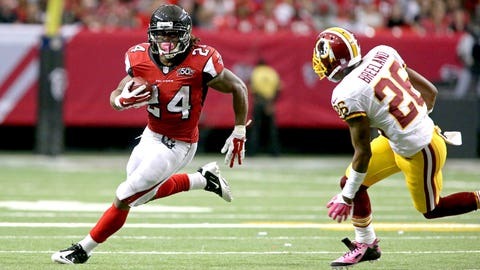 Once again, he’ll look to pace Atlanta’s offense, as the team looks to get their sixth straight win Thursday.